The National Weather Service has issued a Winter Storm Warning for parts of Eastern PA through Thursday morning as a major coastal storm is forecast to produce significant impacts: heavy/wet snow, gusty winds, power outages, ice and hazardous travel. Keep all potential sources of fuel paper, clothing, bedding, curtains or rugs – at least three feet away from sources of heat. Driving in a winter storm presents its own unique challenges. The Red Cross has steps people can follow to get their vehicle ready for winter as well as what they should do if they are caught in a winter storm. DRIVING IN WINTER: While the Red Cross encourages you to stay off the road if possible, if you have to drive in snow or freezing rain, follow these tips. • Fill the vehicle’s gas tank and clean the lights and windows to help you see. • Pay attention to the weather forecast. Before you leave, let someone know where you are going, the route you plan to take, and when you expect to get there. If your car gets stuck, help can be sent along your predetermined route. • If you must drive, make sure everyone has their seat belts on and give your full attention to the road. Avoid distractions such as cell phones. • Know that ramps, bridges and overpasses will freeze before roadways. • Stay with the car. Do not try to walk to safety. • Tie a brightly colored cloth (preferably red) to the antenna for rescuers to see. • Don’t run your engine and heater constantly to help avoid running out of gas. Don’t use things like lights or the radio without the engine running so the battery doesn’t conk out. • If you can, move your vehicle off the roadway. Stay with it – don’t abandon it. If you have to get out of your vehicle, use the side away from traffic. • Start the car and use the heater for about 10 minutes every hour. Keep the exhaust pipe clear so fumes won’t back up in the car. • Leave the overhead light on when the engine is running to help rescuers see the vehicle. • Keep one window slightly open — away from the blowing wind — to let in air. 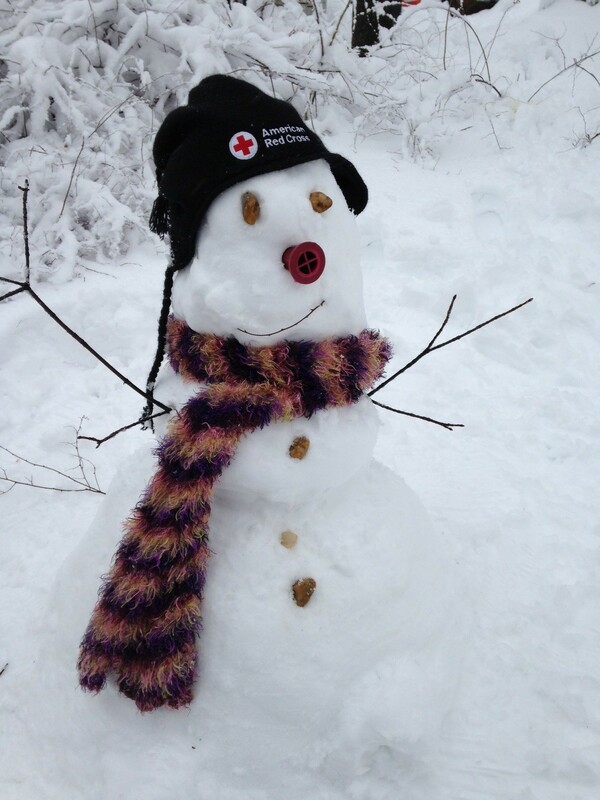 WEATHER ALERTS AND FIRST AID TIPS: People can download the Red Cross Emergency App for instant access to winter storm tips and weather alerts for their area and where loved-ones live. Expert medical guidance and a hospital locator are included in the First Aid App in case travelers encounter any mishaps. Both apps are available to download for free in app stores or at redcross.org/apps. The second Nor’easter in less than a week struck Eastern Pennsylvania today, delivering another round of heavy, wet snow. The weight of that snow has led to additional power outages across the region. The Red Cross is working with local officials to determine if additional shelters will be required due to this new round of power outages. In addition, the Red Cross is also supporting several partner-run shelters and daytime warming centers throughout all of Eastern Pennsylvania. For warming center locations near you, contact your municipality or county emergency management agency. Power outages are expected to last for at least a few more days in some places. The Red Cross has some important safety tips to keep you and your family safe as you wait for the lights to come back on. Inclement weather and power outages in March have caused blood drive cancelations that have resulted in thousands of units of blood and platelets to go uncollected throughout the Eastern U.S. including more than 1,000 units in our region. Every day in Eastern Pennsylvania and New Jersey, the Red Cross needs to collect close to 800 units of blood and platelets—regardless of the weather—in order to meet the needs of patients. Donors of all blood types are encouraged to give as soon as they are able to help ensure hospitals have an adequate supply of blood and platelets. To find a donation site near you, visit redcrossblood.org, call 1-800-REDCROSS or download the free Blood Donor App. The impacts of last week’s Nor’easter continue to be felt across Eastern Pennsylvania even as another major winter is moving in. Heavy snow is expected region-wide on Wednesday, impacting travel and power restoration efforts. Tens of thousands are still without power across Eastern Pennsylvania. The American Red Cross Eastern Pennsylvania Region is in the midst of its largest response since Hurricane Sandy in October 2012. The Red Cross has staffed or supported more than a dozen shelters in Eastern PA since Friday evening. Very cold temperatures and dangerously low wind chills continue to affect Eastern Pennsylvania. Know the signs of hypothermia – confusion, dizziness, exhaustion and severe shivering. If someone has these symptoms, they should get immediate medical attention. Avoid frozen pipes – run water, even at a trickle, to help prevent them from freezing. Keep the thermostat at the same temperature day and night to help avoid freezing pipes. Open cabinet doors to allow warmer air from the room to get to pipes near sinks, etc.